City Junk & Gardening is London’s premiere waste disposal and gardening company. We work hard every single day to tidy up the nation’s capital, by offering an unbeatable range of services at prices that will make you do a double take. If you are a resident of Bromley, rubbish collection will never be a chore again with us on your team. We promise you will be delighted by the services we offer, and once you try us the first time, you are bound to come back time and time again, because we don’t cost the earth. We can cater to your every need if you live in and around Bromley. Waste disposal at regular intervals, or a large one-off clearance, whatever you have in mind, just give us a call today! As a company that is passionate about providing the best possible level of service, we make sure to hire only the most skilled and knowledgable helping hands. They never leave early or with the job half done. They stay until you are completely satisfied. Full clean-up is offered as standard with every job, no matter how big the rubbish pile, we will leave your site spick and span. We offer the easiest to use Bromley refuse collection services, all year round to both commercial and residential customers, and never rest and put our feet up until we get that waste and rubbish out of there. We also offer the London Borough of Bromley garden waste collection: the perfect way to make sure your beautiful garden stays looking its best after a big job or clear out. Our aim is to take the hassle and cost out of life if you live in Bromley. Waste collection at regular intervals is a quick and easy way to remove everyday rubbish from your residential or commercial property. All organised at times and places that fit in with your day, and because we practice the art of green waste disposal, we make sure to minimise the amount of refuse that ends up in landfill. We said no job is too big for our team, and we meant it Bromley! 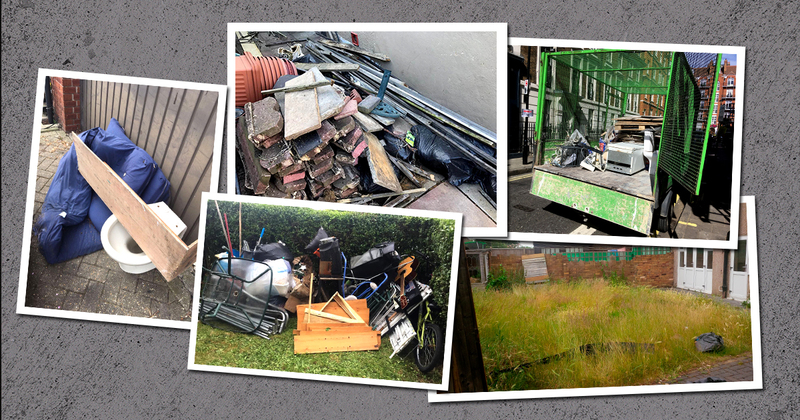 Rubbish removal services are available so you can clear a large site with ease. Just give us a call, and we will put our back into it straight away. We offer the full service, whether it be removing a single large item, to a full house clearance, we have it covered for you! Rather than look elsewhere and run the risk of poor service, make sure you come straight to us if you live in Bromley. Waste collection, is a skill that we have got down to an art, and our gardening services, aren’t too shabby either! We can even offer you expert tree surgery. To find out how we can provide you with the best customer experience anywhere in Bromley, contact us today.